In this day and age of extremely limited incomes and childhood obesity, parents can often find it difficult to find inexpensive toys for kids that will fit their budget and keep their children both entertained and active. However, the five toys included in this review are designed to be both budget and kid friendly, and best of all, they will help your child stay active while improving their motor skills. Kidoozie is known for making imaginative and fun toys that help children develop gross and fine motor skills and make learning fun. The Kidoozie Foam Pogo Jumper is the perfect toy to help your child increase their balance and engage in some active fun, either indoors or out. This foam pogo jumper has all the right features to make this a favorite toy for all the members of the household. 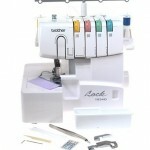 It is guaranteed to insure that kids, and even the more adventurous adults, have a hopping good time. This is a fun toy that not only will help your child burn off excess energy safely, but also will encourage them to be more active, while helping them improve balance and gross motor skills. Best of all, parents can join in the fun of using this foam pogo jumper (if you can get the kids to let you play with it!) and get in some great exercise of your own while having fun. Reviews for the Kidoozie Foam Pogo Jumper are excellent, and most consumers who purchased this toy felt that it was an excellent price for a toy that was going to provide a lot of fun for children of different ages, and even a few adults. Fun for everyone, even the adults who tried it admitted that hopping on the foam jumper was great fun. The one thing that several customers felt detracted from this toy was that it has a built in squeaker that squeaks with every hop. While some customers felt this squeaker was extremely annoying, other customers felt it wasn’t annoying at all. For over 65 years, the Wham-O Corporation has been known for some of the most fun toys for people of all ages. Some of their most well known toys are the Frisbee and the Hula Hoops. Hula hoops are one of the most inexpensive and fun toys of childhood. This 3 Piece Hula Hoop Set will help keep the children in your family entertained for hours on end, and they will learn all types of cool hula hoop tricks. What’s not to like about a trio of hula hoops? Anyone who had one of these toys as a child can remember how much fun a hula hoop can be, and this still holds true for this generation as well. If combined with a hula hoop trick book, this inexpensive toy may occupy your child all summer and fall long. There are not very many reviews for the 3 piece hula hoop set at present. 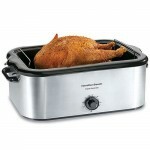 However, the few reviews to be found are extremely positive. The simple fact is that these are well made hoops that can provide hours of fun. The Green Toy Company is a company that firmly believes that toys should be fun, safe, and good for the environment, which is why they construct their line of classic and fun toys from recycled plastic and other environmentally friendly materials. The Green Toys Jump Rope is just one example of this company’s belief that fun toys can be simple, fun, and good for the environment. The Green Toys Jump Rope is a simple jump rope that can be used by children and most adults who love jumping rope and want to stay active. Learning to jump rope is not only fun, but great exercise as well, and both girls and boys like trying out different ways to jump rope and improving on how many jumps they can do without missing. The twist handle for shortening and lengthening the rope is handy. 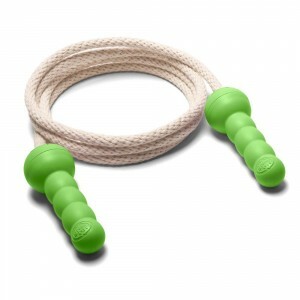 This environmentally friendly jump rope gets good reviews, but then again, it is difficult to find fault with a rope with handles. However, most customers did like the fact that this rope’s handles were made of recycled materials, and that the rope itself is nice and thick. The rope is sturdy enough to provide months of fun. The Gymnic brand is produced by the Ledraplastic Company, a company that has been making non-toxic vinyl toys and exercise equipment since 1963. The Gymnic Hop Ball (Hop 66-26″) is a combination of a fun toy and a reasonably priced piece of exercise equipment that provides a lot of laughter and exercise for both children and adults. Hop balls have been around under one name or another for years, and have always provided fun and laughter while helping children, and even adults, to improve their balance. 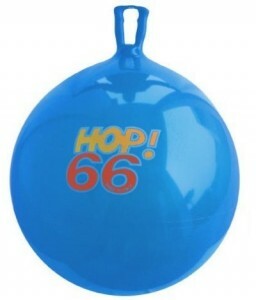 This is a fun way to get in a little bit of exercise, and this particular Hop Ball is large enough for adults to ride. If you have a young child, you might want to consider purchasing a smaller size hop ball, the Gymnic Hop 45 Hop Ball or the Gymnic Hop 55 Hop Ball. Reviews for the Gymnic Hop Ball are great, with most customers finding that their children, and even themselves, find these balls to be great fun and offer an excellent way to work out. Shows kids that parents can play too! A few customers did find that the handle pulled apart or off the ball, but this could be due to pulling up on the handle, rather that simply using it to hold onto. The World Footbag Company has been in existence for many years, and today has over 130 different footbag products, and is considered to be the largest footbag product company in the world. 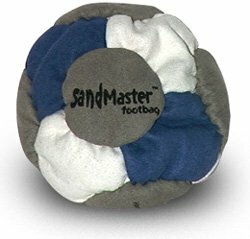 The Sandmaster Footbag (Hacky Sack) is just one of the many products this company has to offer. The Sandmaster Footbag (Hacky Sack) looks to be soft, but not too soft or not too firm. The faux suede material gives this little bag a more professional and refined look that some of those brightly colored one simply don’t have. Reviews for the Sandmaster Footbag (Hacky Sack) are extremely good, with customers stating that this footbag is perfect for both beginners and those who play the game on a regular basis. Customers did note that you need to prevent the Sandmaster Footbag (Hacky Sack) from getting wet, as the sand tends to get hard, making playing with this footbag properly impossible. As these 5 reviews show, inexpensive toys for kids can be somewhat long lasting, provide hours of fun, and help to keep you, as well as your child, stay active!